Olde Towne Steak and Seafood opened its doors in 1981. Owner, chef Greg Harding, along with his wife Hyon run the establishment that serves its specialties to the dinner crowd. Since dinner’s the only meal served, the staff makes good use of the afternoon preparation time to ready the nightly offerings. Their menu boasts large portions of hearty fare from Prime Rib to Whole Maine Lobster. Salmon Olde Towne is another featured entree and there are two different preparations featuring Jumbo Shrimp, Jumbo Lump Crabmeat and Bearnaise Sauce. Tender and juicy steaks are cooked to order in a variety of cuts and sizes. The atmosphere is warm and accented by generous amounts of dark stained woodwork and several fireplaces for a romantic and comfortable ambiance. 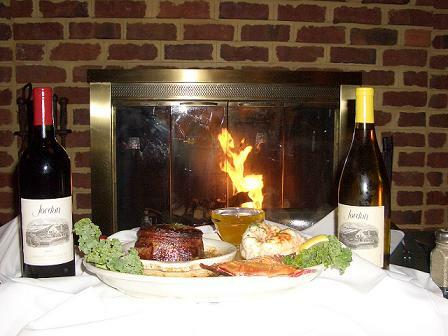 Next time you’re dining out or heading through Fredericksburg, make Olde Towne Steak & Seafood an evening destination for your dining pleasure.